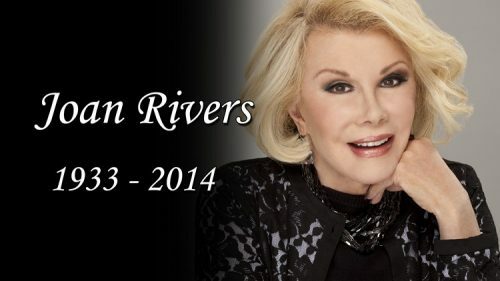 Emmy-winning Rivers’ accomplishments included being an actress, comedian, writer, producer and television host, best known for co-hosting the E! Celebrity fashion show, Fashion Police, and starring in the reality series Joan & Melissa: Joan Knows Best? alongside her daughter Melissa Rivers. Rivers, was rushed to Mt. Sinai hospital at about 9:40 am in critical condition after she stopped breathing while undergoing a throat procedure at the Yorkville Endoscopy clinic on E. 93rd st. It was unclear how long Rivers was without oxygen so Doctors medically induced coma after she went into cardiac, respiratory arrest. Doctors took her out of the coma this week to assess the damage and moved her to a private room. Rivers first came to prominence in 1965 as a guest on The Tonight Show. Most recently she was the host and producer of an online weekly talk show on YouTube called In Bed with Joan. She was a resident of Malibu, California, with her daughter and grandson. Joan Rivers had a net worth of $150 million dollars. Her family has thanked the public for the outpouring of love and support.